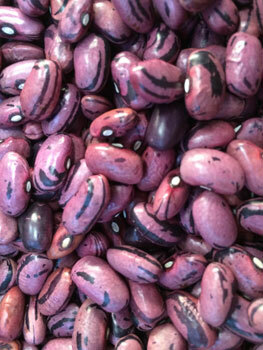 Dried beans: This striking purple heirloom variety is called Rio Zape (pictured above). It’s incredibly smooth and flavorful, and works in a wide array of dishes, from soups to casseroles. Matt likes these just cooked up and tossed with some simple ingredients, such as red onion, olive oil, balsamic vinegar and salt. These beans also starred in the most incredible enchiladas we’ve ever made (and we make a lot of enchiladas). Here’s my recipe for infinitely adaptable Loaded Enchiladas if you’re interested. Sweet corn: Last corn for this year! Savor the final flavors of late summer. Cyndee made a corn chowder the other day that was really yummy. This could also go in your enchiladas. Spaghetti squash: When cooked, you can scrape out the flesh of this squash into thin ribbons that resemble spaghetti noodles. 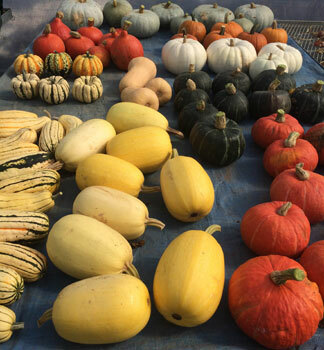 This is a mild-tasting squash often paired with marinara sauce. You can truly use it like you would a bed of noodles, and top with sauce, meat, onion, etc. Or, here’s a super simple recipe for Spaghetti Squash with Parmesan Cheese. Cauliflower: Our heads of fall cauliflower are SO big right now that, in order to not skew your CSA box toward predominantly cauliflower (some heads are up to 5 pounds, so at $3 a pound, that’s a lot of cauliflower! ), we cut them in half. So everyone gets a big half-head. So great for some warm comfort foods this time of year, such as cauliflower cheddar soup (could do a combo of cauliflower and the broccoli florets), curried cauliflower, or roasted cauliflower with herbs and cheese. Jalapeno peppers: Spice up a dish, stuff with cheese and other savory ingredients and bake, or perhaps pickle these guys for later use in winter. I just pickled and canned several half-pints of jalapenos, and it’s so nice to have them on hand all year.